It’s very, very early in where we choose to drop anchor in the next film. It could be five years after the event, it could be the night after the events of where we left ‘Dawn,’ so it’s very difficult to know where the story is going right at this moment because it’s being written as we speak. I know that part of the desire for Matt [Reeves] to do this next movie is about continuing the enjoyment of seeing these apes evolve. So I don’t think we’re going to see a situation where we’re jumping…. It might be three films, It could be four. It could be five. Who knows? But the journey will continue. It might not necessarily be summarized or completely fulfilled in this next one. The point being, eventually we know that we’re going to end up back at ‘The Planet of the Apes,’ but whether it’s this film or not, I don’t know. Especially if the third Apes film is a hit, as the previous two were, you have to think 20th Century Fox will want to extend the trip as long as the can. It would be cool to see them get to the point where the world is similar to the one we saw all those years ago in Planet of the Apes. That would help give a feeling of completion to the new series. And these movies have been awesome, and we’ll keep watching them as long as they’re good. 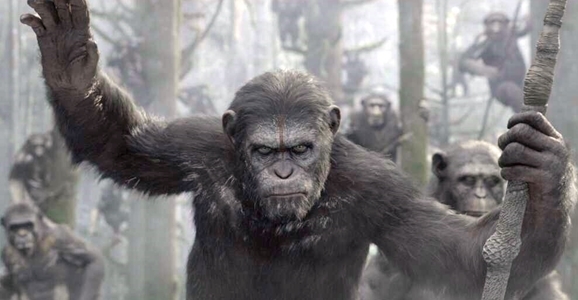 On that note, Dawn of the Planet of the Apes hits Blu-ray next week. What do you think? Would you like to keep seeing more of these new Planet of the Apes movies, or would you like to see them cut it off after the next one? What I’d like to see is that the next movie be a direct lead into the original series, to kind of end the current chapter of prequels of the first films. Then, with the originals having been first released over 25 years ago, remake the originals, drawing heavily and/or showing a direct relationship between these movies and the prequels. Can you imagine the original ‘PotA’s with today’s CGI/motion capture technology and modern actors and actresses?! To be honest, I think that is the way the Star War franchise show have been handled in my opinion. Instead of how they handled the prequels and sequel of the original trilogy, perhaps they they should have taken a Lord of the Rings approach. Starting from the beginning, film the first volume (three films) all at once, keeping all the continualty intact. Then remake the original series/chapter/volume (all three films) in the same way and again keeping the continualty intact and shooting them at the same time. And finally the last installment, using all the same actors and processes. I think it took LotR’s three months of one year to film what they have taken three years to bring to the silver screen. In Star Wars followed suit, taking three months to film one volume of three movies in three consecutive years (they could probably reduce the three films to two in each volume, because they wouldn’t have to introduce and then reintroduce some of the characters as the go from film to film, there by trimming some of the fat, as it were), they could literally release two films every two years of the main franchise and still have room for spin off movies! If you are referring to the Planet of the Apes with Charlton Heston, those came out in 1968. Yes, technically it’s more that 25 years, 46 to be precise as of this writing. I love planet and wish it would continue as the original but better.